This cosmopolitan global hub is skirted by traces of its agrarian past. Our top 10 list will give you the key to exploring multiple facets of this Pearl of the Orient. This week, Hong Kong was named among the top 10 in a global competitiveness index produced by the nonprofit World Economic Forum. The territory had jumped three places in the index this year, surpassing Japan, China and Taiwan, based on factors such as administrative policies, education, technological development, efficiency, infrastructure and others, according to a report in the South China Morning Post. Hong Kong has long been an economic center and thriving port city, a symbol of prosperity since it was leased by the British in the 19th century. It was given its name, meaning “fragrant harbor” in Cantonese, in the 1840s when European traders coming to Hong Kong were lulled by the sweet smell of incense wafting from the incense factory near the harbor. Today, the island territory, a Special Administrative Region of China, is made up of about 260 islands, dozens of which are uninhabited. Its unique political status has allowed Hong Kong to operate under its own constitution and engage in free trade relations with other countries, while still falling under China’s wing for foreign relations and defense matters, according the U.S. State Department. I had the pleasure of experiencing this cosmopolitan financial hub when I visited Hong Kong in 2011, and I was impressed by both the modern metropolis that it flaunts at its center, as well as the rural landscapes that stretch from its outskirts, vestiges of its agrarian past. 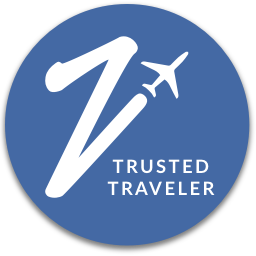 If you’re staying in Kowloon, where many hotels are located, take the subway to “Central,” and take a walking tour of the city along Hollywood Road, up Pottinger Street, toward the Central district of the city. That’s what I did my first day in Hong Kong, since I was staying at the Sheraton Kowloon. Hollywood Road was the second road built in Hong Kong after it became a colony. The first was Queen’s Road Central. However, the Sheung Wan portion of Hollywood Road is identified as the “possession point” from where the British launched their occupation of Hong Kong on Jan. 24, 1841, after China ceded the island to the British. 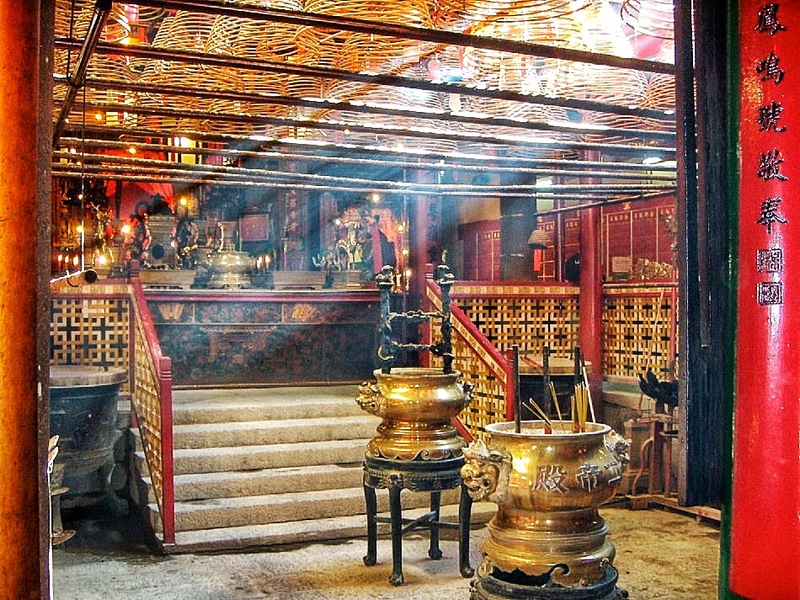 Here, you can pay a visit to the Man Mo temple, a Taoist temple built by Chinese merchants between 1847 and 1862. 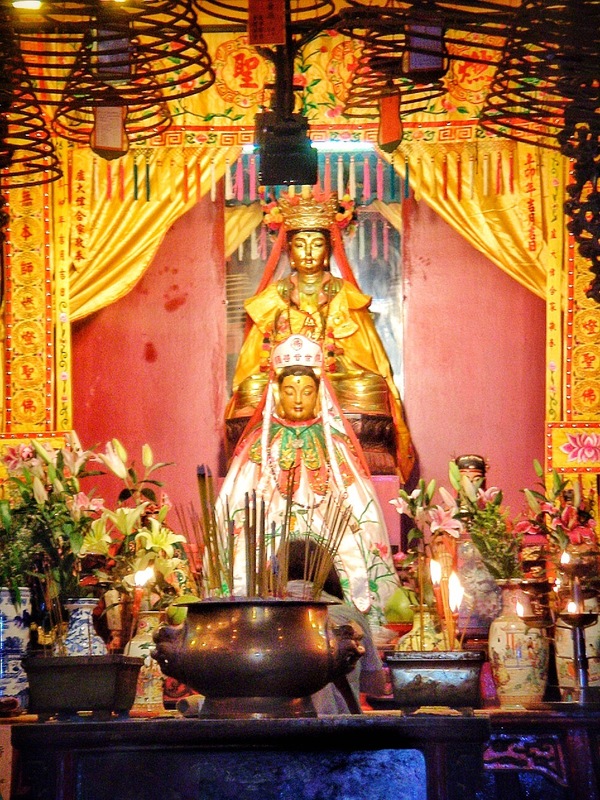 The temple is meant for worship of Man Cheong, the Taoist god of literature, and Mo Tai, the Taoist god of martial arts. However one block of the temple, the Lit Shing Kung, is dedicated to the worship of all heavenly gods. The Chinese living near the area have even used this temple as a meeting place to resolve community disputes in the past. From the temple, walk toward the main part of the city, passing several antique stores and French restaurants along the way. Hollywood Road is known for these antique shops, which are filled with memorabilia from the Ming dynasty. I was initially surprised by the presence of so many French restaurants and French people in Hong Kong. I knew it had been a British colony, but was unaware of its French connections. However, Hong Kong apparently plays host to the largest number of French people in Asia — 12,000 registered, 15,000 estimated— with about 600 French-related companies employing 40,000-plus people in the territory, according to the French Chamber of Commerce and Industry in Hong Kong. Because it’s so easy to set up a private limited company in Hong Kong— and because it’s the second-highest buying power in Asia— the French view this as an “efficient market,” according to the Chamber. In the midst of major financial centers and banks are Hong Kong’s government offices and Legislative Council building. Here, in the middle of all the skyscrapers, you can pause to relax in Chater Garden, now used for political demonstrations and rallies thanks to its prime location in the Central district by the Legislative Council. When I walked through the city, I wanted to eventually work my way to the lower tram terminus where I could catch the tram that would take me up to Victoria’s Peak to catch the Hong Kong skyline by night. 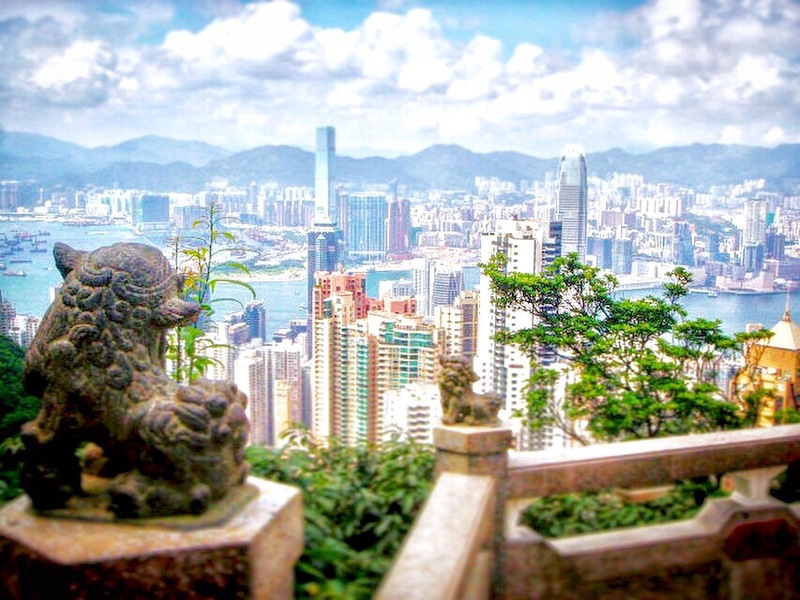 For stunning panoramic views of this port city, you’ll want to head to Victoria’s Peak. Just as the sun was starting to slip lower that first evening, I made my way to the lower peak tram terminus. Since I wasn’t with a tour group, I waited in line for more than an hour to catch this tram to Victoria’s Peak, which is situated 396 meters above sea level and named after Queen Victoria. The tram was established in 1888, starting first as a wooden construction with the capacity to seat 30 people. Some of the wealthier families had already started to settle on the peak years earlier as Hong Kong’s population grew, but traveling to the top of the peak required use of a sedan chair hoisted by up to eight coolies. By 1926, a newer steel-and-wood structure could seat up to 52 people, and by 1948, the tram was revamped in steel and aluminum to seat 62. An all-aluminum tram was established in 1959 bumping the tram’s capacity to 72. However, today, there are other ways to reach the peak: by a foot path, for those feeling athletic, and a winding road by car or bus. Whichever route you take, the trip to the peak’s highest point, the Sky Terrace, 428 meters above sea level, is well worth it. 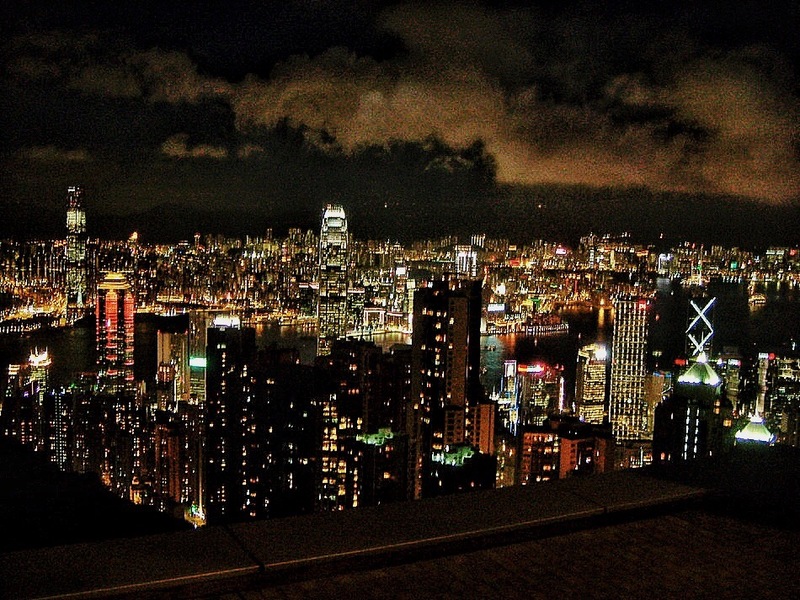 You get a complete view of the Hong Kong skyline, whose skyscrapers are not only centers of business, but residential complexes as well. Since I’d heard it wasn’t enough to see the view from Victoria’s Peak by night, I also took a guided tour by Splendid Tours the next day, which included a trip to the peak via air-conditioned bus. The tour, led by a bubbly and energetic guide named Ivy, was very informative, and I would completely recommend it to anyone looking to see multiple sights in the city during a brief visit. I had time to kill before my afternoon tour that second day, so I first stopped at the Hong Kong Museum of History in Kowloon to get a better understanding of the island’s history and culture before seeing more sights. 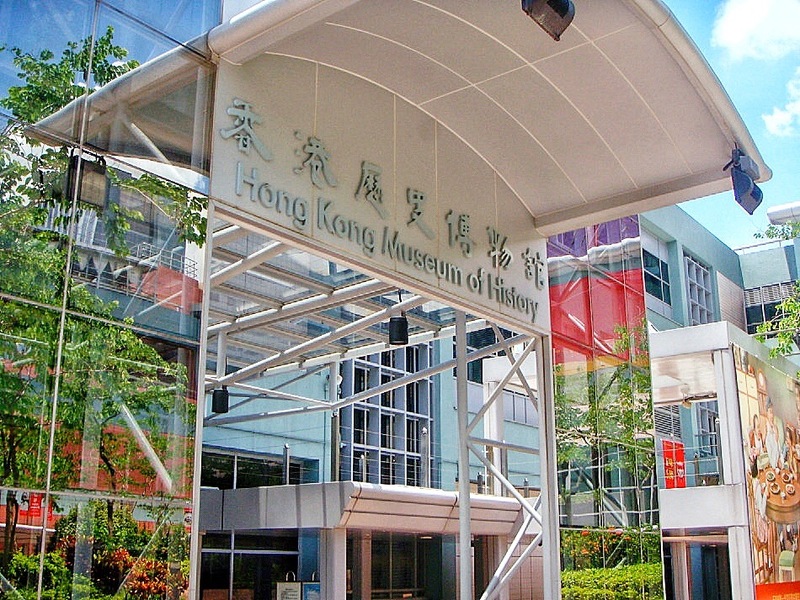 This museum offers a comprehensive history of the territory, and is a great way to digest Hong Kong’s cultural past before taking in the rest of the city’s attractions. The museum itself took six years to build. It boasts a modern multistory design, eight extensive galleries as part of the permanent exhibit, and state-of-the-art toilet facilities (always a plus). The permanent exhibit, “The Hong Kong Story,” spans 400 million years of Hong Kong’s geographic, social, political and cultural history. In fact, I wasn’t able to get through all of the galleries given the time constraints and the multitude of displays and reading material provided. The only thing I knew about Hong Kong before I visited was that it was once a British colony, and it was only recently handed back to the Chinese. Actually I remember when my family was once flying through Asia in 1996 just before Hong Kong was freed from English colonization, there were banners and posters in certain airports announcing Hong Kong’s approaching independence, which is why this stuck out so clearly in my mind. But I learned that Hong Kong only became a colony in the mid-19th-century. Prior to that, the island was inhabited by four main Chinese ethnic groups who had migrated from the mainland: the Punti, the Hakka, the Tanka and the Hoklo. The Punti were considered the “local” people, as they had migrated to Hong Kong early on, in the mid-900s to 1120s. It was following the Qing dynasty’s decline toward the end of the 18th-century that the presence of foreign powers in China’s coastal areas became more apparent. The British traded opium from India in exchange for Chinese tea. But the the Chinese quickly realized the addictive and debilitating effects of opium, and in 1839, imperial commissioner Lin Zexu placed a total ban on opium under instructions from the emperor. To put the Chinese in their place, the British decided on a “punitive” approach, leading to armed conflict, according to the Society for Anglo-Chinese Understanding. By 1841, Qing officials succumbed, handing over Hong Kong Island to the British. It remained a British colony until 1997. It was Vasco da Gama who first discovered Hong Kong in 1498 when looking for new sea routes to China, according to my Splendid Tours guide. Then the Portuguese, Dutch and English all took an interest to claiming land in Asia for trade. The Portuguese took Goa and Malacca in Malaysia, moving their way up north to China and finally arriving in Macau in 1514. By 1557, the Portuguese settled in Macau, paying the Chinese government annual rent. This set the precedent for Europeans to lease land in China, which would later influence Hong Kong’s occupation by the British. It’s just another example of how Asian cities are replacing their U.S. counterparts as the world’s major commercial centers. As China and India’s economies are burgeoning due to increased productivity and modernization, American leaders look to raise the U.S. debt ceiling for short-term fixes for the U.S. economy. Within Hong Kong however, people can only place bets on three things, legally: the lottery, football, and horse racing, which is the most popular, and is handled by the Hong Kong Jockey Club. I didn’t get a chance to visit Macau on my trip, though Ivy said it’s only an hour-long ferry ride away. 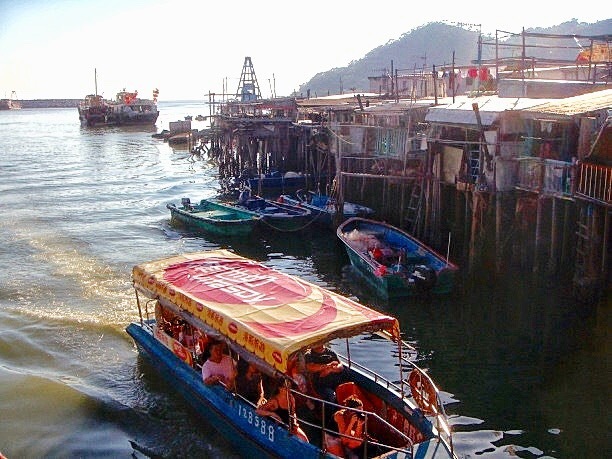 Tour Aberdeen Harbour by sampan, or “small boat,” to get a better look at the boats in this fishing village. 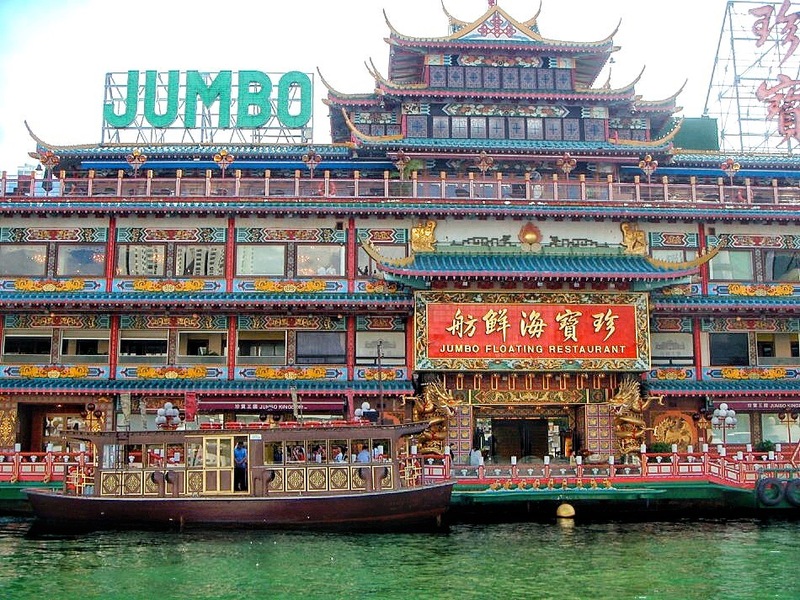 Tourists have the opportunity to experience dinner and entertainment at the “world’s largest floating restaurant,” the Jumbo, as well. By the harbour’s 2010 numbers, it sees roughly 4-5 million tons in imports and exports, and more than 7,467 vessel arrivals. 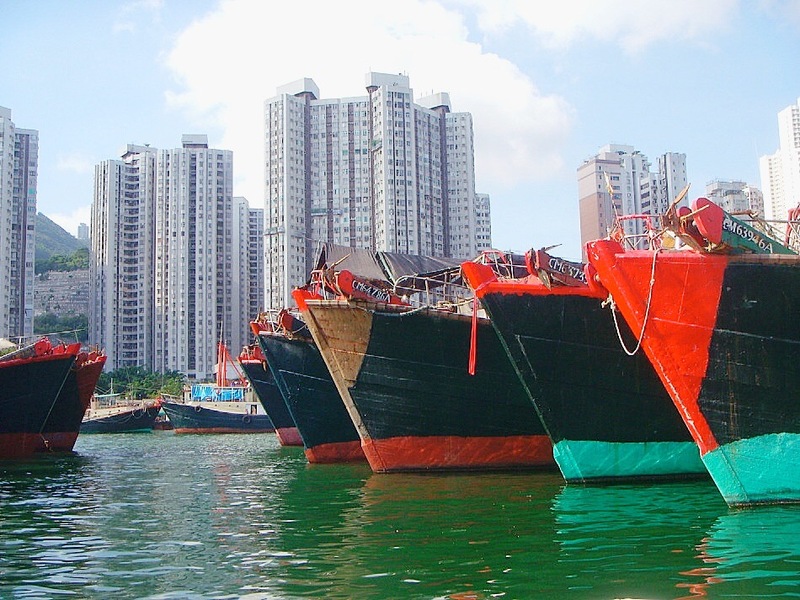 From the harbor, you can make a stop at a jewel factory to get a behind-the-scenes look or shop for souvenirs, as jewelry manufacturing is one of Hong Kong’s largest industries. 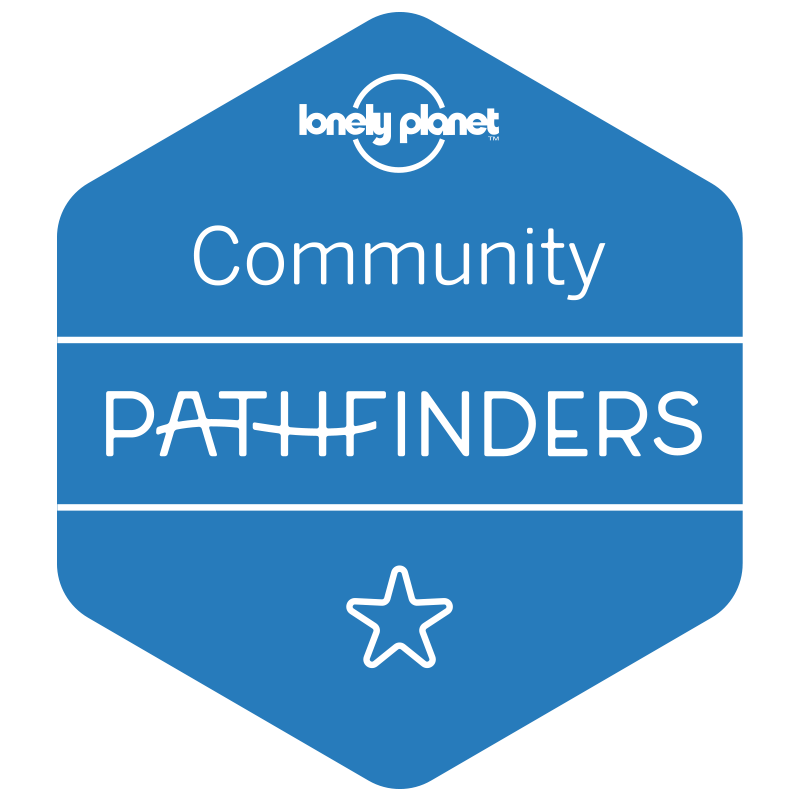 Personally, I have never cared for the behind-the-scenes factory tours as I find that they are simply a means for guides to generate commission. 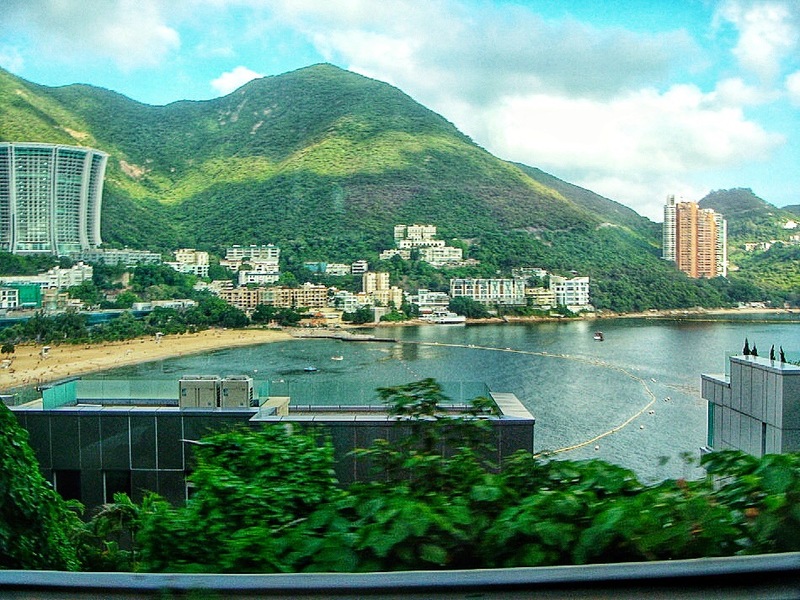 Instead, I looked forward to rest of the trip, as we were headed to Repulse Bay. The bay was named for the British attempts to ward off pirates. Ivy said the hotels along the bay provide a kind of Waikiki feel for Hong Kong residents. They come to this bay whenever they fancy a trip “to the beach.” However, you’ll notice in the photo that a yellow line of buoys marks the area where a net has been placed to prevent shark attacks. We only passed through Repulse Bay to get to Stanley Market. Get your dose of retail therapy at Stanley Market, an open-air market where bargaining is allowed. Shoppers can buy local, handmade souvenirs here. 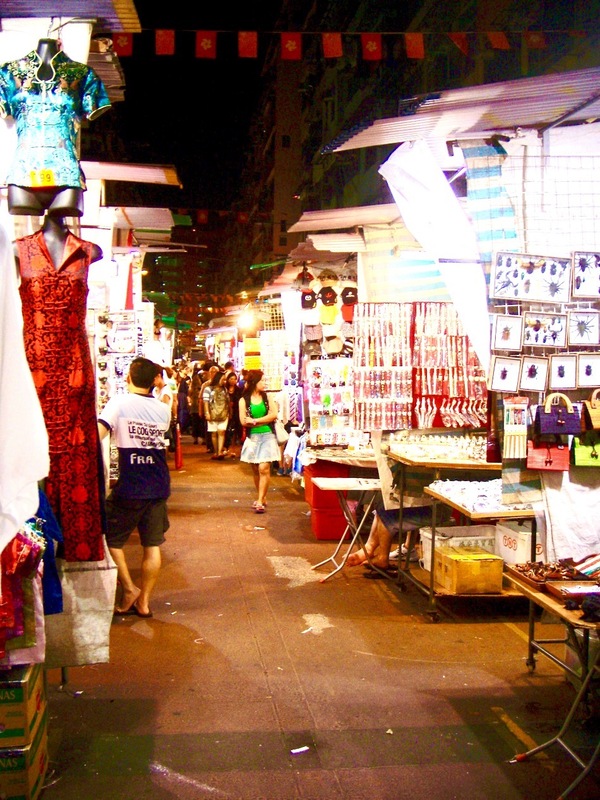 I had heard a lot about the Kowloon Night Market, which wasn’t too far from my hotel on Nathan’s Road, so I took a less-than-five-minute metro ride from the Tsim Sha Tsui station to Jordan and walked about ten minutes to find the market on Temple Street. There’s no official sign or anything, so you just kind of…arrive there and realize that’s it. This buzzing open-air market runs for blocks, and you can find everything here, from wallets and handbags to jewelry, and from clothing to electronics. Kids toys, gadgets, local wear and leather goods are all available here at reasonable prices, and of course, you can always bargain. The exchange rate is about HK $7.70 for every U.S. dollar. Interestingly, because the market offers a lot of inexpensive men’s items, it’s sometimes considered a “Men’s Street,” according to the Hong Kong Tourism Board. The market reminded me of the bazaars we have lining the streets in India, like Pondi Bazaar or Luz back in Chennai. This nostalgia brought me to a hole-in-the-wall Indian restaurant where I had dinner before heading back to my hotel. 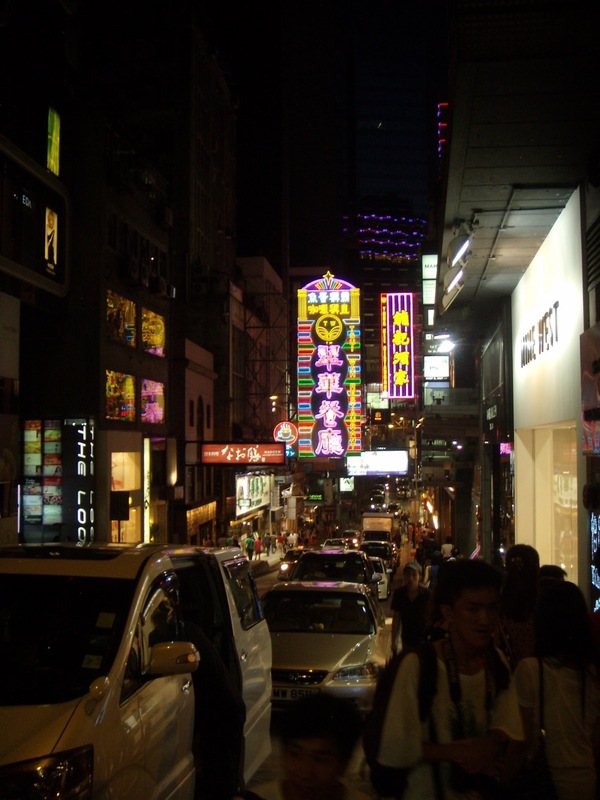 I saved the real nightlife, Lan Kwai Fong, for the next day. Lan Kwai Fong is a street filled with bars, clubs and restaurants, essentially Hong Kong’s “party central,” located near the main part of the city where business executives and prominent financial players go to work each day– and can play later in the evening. Since I was traveling alone, I wasn’t about to go clubbing or bar hopping by myself, so I played it safe and went to the Hard Rock Cafe. 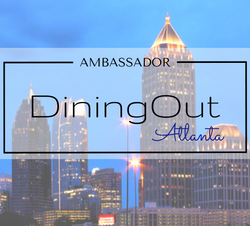 With all the exotic venues along the street within reach, some might say I went with too safe a choice, deciding to go to an all-American restaurant, but I figured this was a place that I could at least get decent vegetarian food while also meeting new people if I sat at the bar. From Hard Rock, my new friends and I stopped at two other places. The first was an 80’s/90’s bar that played music videos that didn’t match the music that the DJ was actually playing. It reminded me of the karaoke joints back in Guam, where a shoddily produced music video of some sappy love song would accompany the heavy metal rendition of what your friends would be singing. Next, we hopped over to what seemed like an English pub. It was one of those places that has a gazillion different types of expensive and unique beers and hundreds of boiled peanut shells scattered all over the floor. Repulsed —and tired— I decided it was time to head back to Kowloon since I had an early flight to catch anyway. I grabbed one of many taxis parked at the corner of Lan Kwai Fong and D’Aguilar Street, and nodded off the moment driver started his meter. 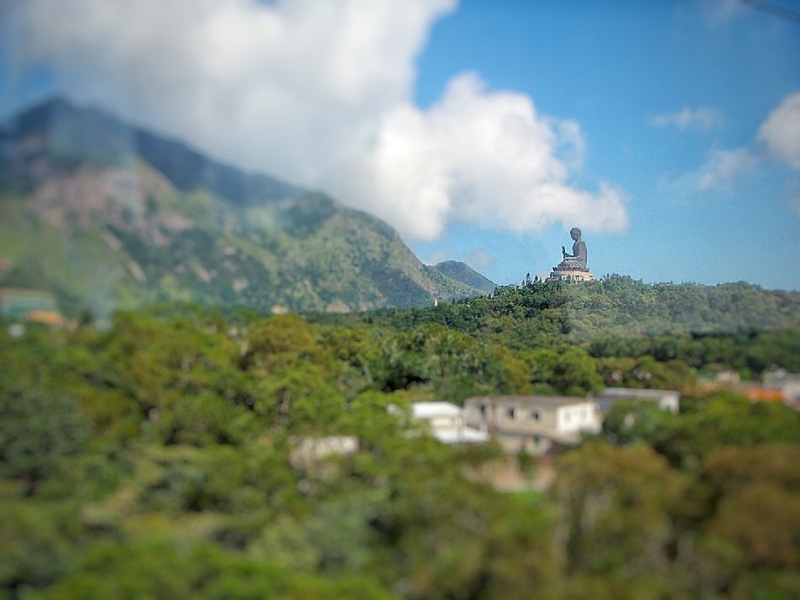 The Tian Tan Buddha, at 34 meters, is currently the largest seated bronze Buddha in the world. However, my tour guide said an even larger seated Buddha is expected to be built in Kushinagar, India, and it will be Buddha in the Maitreya form, or Buddha of the future. 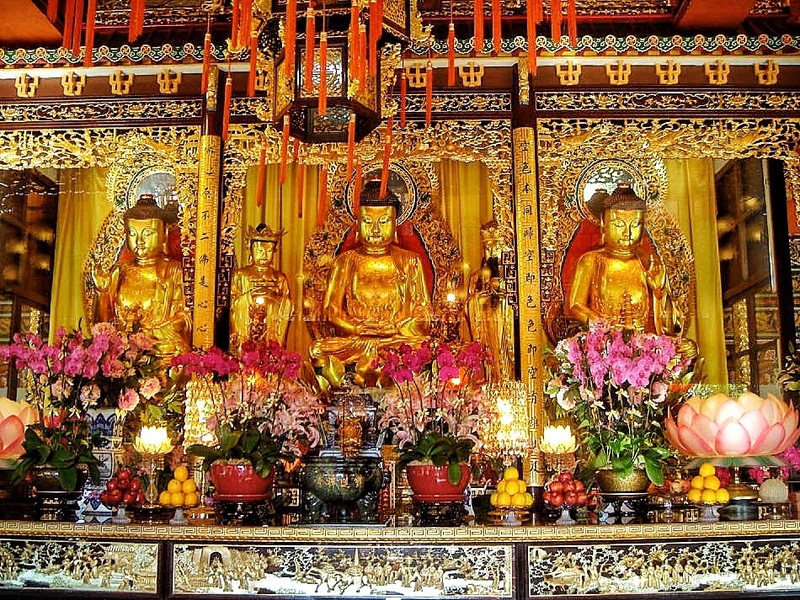 The Buddha displayed in Lantau is the Gautama version, said to be of this lifetime. 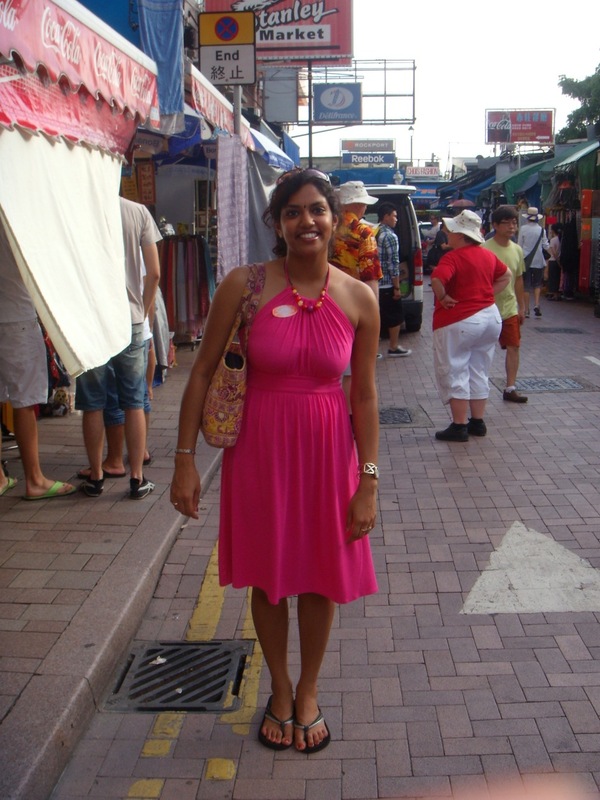 I was keen on visiting Lantau because it plays home to the Buddha and Po Lin Monastery, and normally, when I visit a place and I know there’s a Hindu temple there, I like to go visit. Because Buddhism stemmed from Hinduism and some Hindus consider Buddha an incarnation of Vishnu, I thought as both a tourist and a Hindu, this was worth seeing. Driving from Kowloon to Lantau by your bus, we passed numerous container vessels strewn across Hong Kong’s port. My tour guide said it’s the third busiest port in terms of container traffic, with Singapore and Shanghai being the first two. 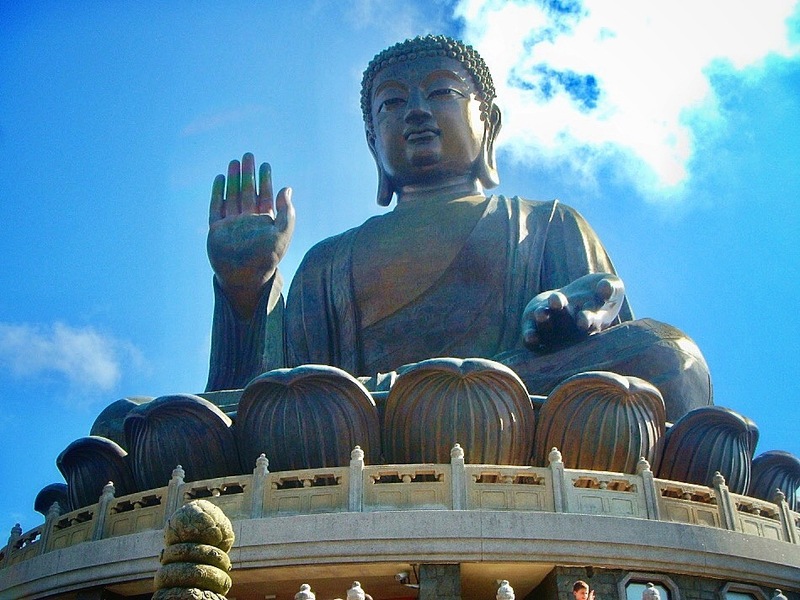 Once in Lantau, to get to the Tian Tan Buddha, very devout followers or nature enthusiasts can hike a long, paved trail over several rolling hills and up 268 steps to the statue. But for those of us looking for a less arduous and more picturesque experience the Ngong Ping 360 Cable Car is worth standing in line for (Although, if you book a tour in advance, you can avoid the long line). The cable car ride spans more then 5 kilometers and takes about 20 minutes or so. You get a great view of some of Lantau’s hillsides and the South China Sea. 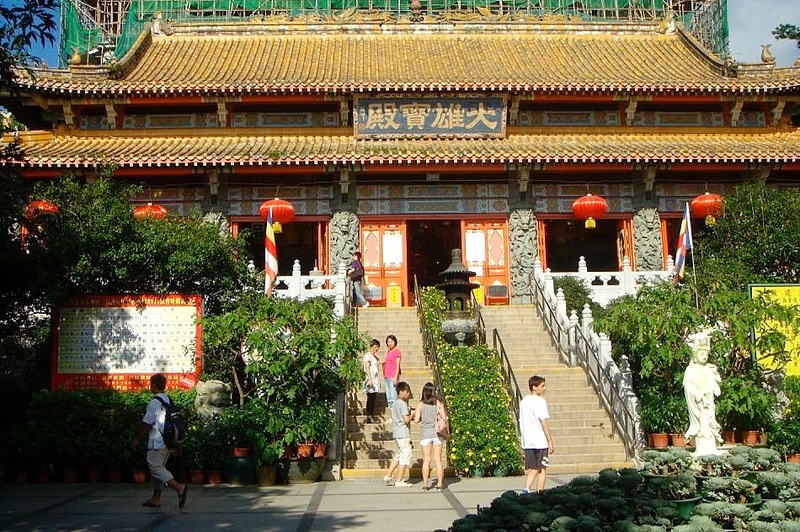 Just below the Tian Tan Buddha sits the Po Lin Monastery, originally established by three monks in 1924. Po Lin refers to “precious lotus.” The lotus is significant in both Hinduism and Buddhism, as it represents “spontaneous generation” such as in divine birth or spiritual development, according to the Buddha Dharma Education Association. My tour guide said at one time, the monastery was thriving with activity, but now it is seeking more Buddhists to join, as its membership has dwindled in recent years to about 20 to 25 monks. One Buddhist monk, Shravasti Dhammika of Singapore, attributes the decline of interest in Buddhism to “commercialized spirituality,” a dissolution in the actual Dhamma teachings of the Buddha as opposed to temple rituals being carried out instead, and a fragmented network of Buddhist groups around the world. “Buddhism is failing to speak to young, well-educated, modern people…. Trying to find out about Dhamma from the average Buddhist rarely works because they rarely know any. Temples and societies emphasize ritual activities rather than solid Dhamma education.” – Shravasti Dhammika, spiritual adviser to the Buddha Dhamma Mandala Society in Singapore. Whether by foot, cable car, tram or bus, you’re bound to find this bustling city is full of things to do and see– and every now and then, amid the cosmopolitan buzz you’ll find scattered hints of the ancient coastal civilization that has learned to thrive even under and against foreign controls, ultimately leading it to become the global economic center it is today. Note: Clearly missing from my list is Hong Kong Disneyland, which many people consider a key attraction in HK. However, as a Florida girl, my loyalties lie with the Disney theme parks in Orlando, Florida.